When two seams to be joined are uneven in length, the longer edge must be drawn in to fit the shorter side. This is done, depending on the degree of adjustment, by easing or gathering, as shown. Slight ease is the type that might be needed along the back side of a shoulder seam. Typically pin basting is sufficient (pins will hold the fabric layers together tighter than thread basting and will keep the fullness from slipping during the stitching process). To do the easing you will work from the longer side, pinning the seam at the ends and notches; then between the notches you will distribute the fullness evenly, pinning where necessary to hold it in place. Remove the pins as you stitch. Moderate ease can be controlled by a dual process of machine basting, then pinning. Machine baste just the area of the longer piece that is to be eased in, then pin the seam at the ends of the basting and notches, as shown in the diagram on the previous page. Pin as needed to hold the fullness, then stitch the seam carefully, removing the pins as you stitch. Gathering is the process of drawing fullness into a much smaller area by means of two rows of machine basting, such as you’d do with a gathered skirt. From the right side, stitch one basting line just next to the seam line; stitch the second ¼” away in the seam allowance. If seams intersect the gathered area, begin and end the gathering stitches at the seam lines. Pin the seam edges together at the matching points or notches. Draw up the bobbin threads, distributing the fullness evenly. Wind the drawn threads around a pin to secure the gathers, as indicated in the illustration on the previous page. Pin baste, then stitch the seam with the gathered side up; this prevents the gathers from becoming crooked and getting too much fabric sewn in with the gathered area. Considering the number of pregnant women I see whenever I’m out in public places, AND remembering how difficult it was to find any type of maternity clothes or maternity patterns when my daughter was pregnant with quadruplets, I’d say specializing in making maternity clothes could be very lucrative! I see pregnant women that are plus sizes, as well as some who would be considered “average” or even smaller and more petite sizing. The majority of what I see, however, are larger sizes, and I can assure you that they are having a very difficult time finding clothing, patterns or somebody to do some sewing for them. By far the easiest way to get into making maternity clothes is to see if your customer has some type of basic pattern that she’s had made before and that she knows will fit properly. You can take that pattern and convert it to maternity styles. Converting store bought patterns into maternity styles is very easy and you can make a wide variety of maternity garments for your customer, using just that one basic pattern. If the customer is new and you’ve never sewn for her, and she doesn’t have any basic patterns for you to convert into maternity styles, you can always make maternity patterns for her by using her own personal measurements. Pattern making for maternity will require a little more effort and time than simply converting a commercial pattern that is already available, but your customer will greatly appreciate your going the extra mile for her. Look around the next time you’re in the mall or a restaurant or any other public place to see how many pregnant women there are. Put some flyers or informational brochure at places of business that allow you to post such things, and you might be surprized at the amount of new business you get. 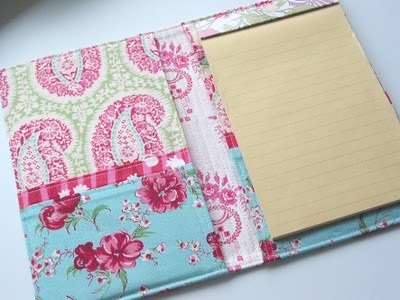 I carry a notepad with me everywhere I go, I’m definitely a list person, so I was thrilled to find this project tutorial for a fabric folder or portfolio at Niesz Vintage Home! I absolutely adore her color and fabric choices, and her step by step instructions include terrific photos to help make assembly easy. I’m planning to make several of these for gifts! 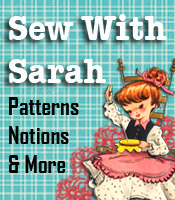 There are three main types of seams that you will be using for most of the sewing items you will make. (1) A straight seam is the one that is used most often. In a well-made straight seam, the stitching is exactly the same distance from the seam edge the entire length of the seam. In most cases, a plain straight stitch is used. For stretchy fabrics, however, a tiny zigzag or special machine stitch may be used. (2) A curved seam requires careful guiding as it passes under the needle so that the entire seam line will be the same even distance from the edge. The separate seam guide will help here, so will running the machine slower than usual. (3) A cornered seam needs reinforcement at the angle to strengthen it. This is done by using small stitches for 1” on either side of the corner. After completing the “corner” you can switch back to the regular stitch length. It is also important to pivot with accuracy so the seam line will be correct on both sides of the corner. When cornered seams are enclosed, as in a collar, (shown below) the corners should be blunted so that a better point results when the collar is turned. Blunting the corner is done by taking one stitch diagonally across the corner of a fine fabric (A); two on a medium one (B) and three stitches on a heavy or bulky fabric (C).